It’s strange to begin a restaurant review by talking about another restaurant, but bear with me for a moment. 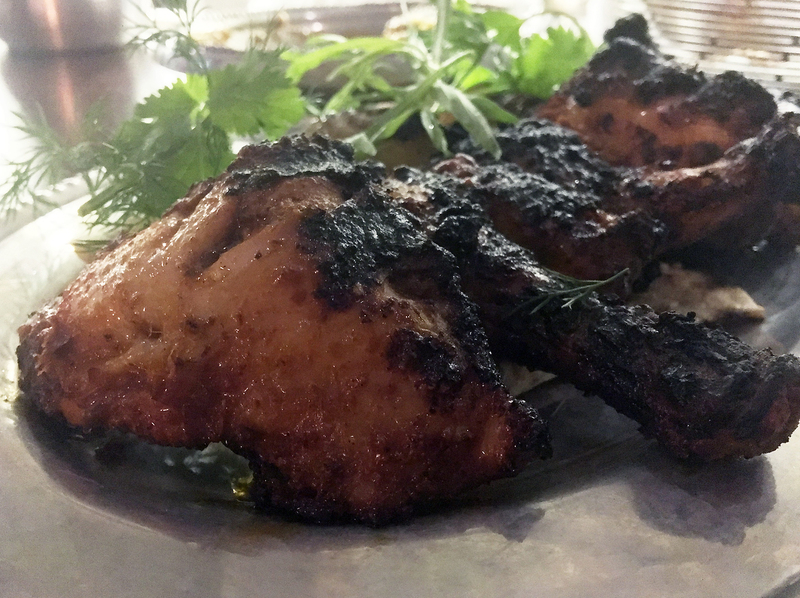 Some of the best dishes at Brigadiers, an Indian restaurant in the City, were the kebabs which meant it was immediately noticeable when the kebab chef responsible, Kian Samyani, left Brigadiers’ clubby embrace. 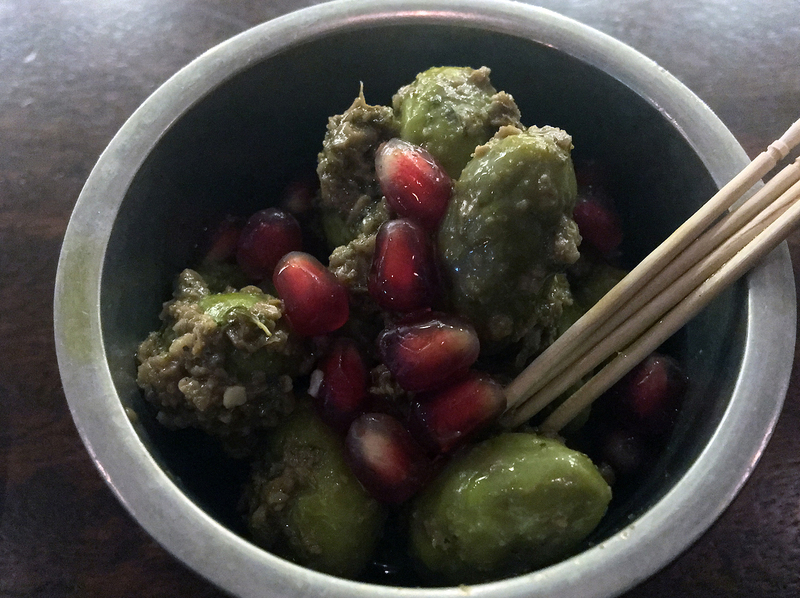 Samyani is now the driving force behind Berenjak, a restaurant in Soho focussed on Iranian cuisine – or at least kebabs and stews, which are probably the most immediately accessible Iranian dishes for a Western clientele. As expected for a JKS-backed restaurant, service was a well-oiled machine – no doubt helped along by a few old hands from other JKS eateries including Brigadiers. 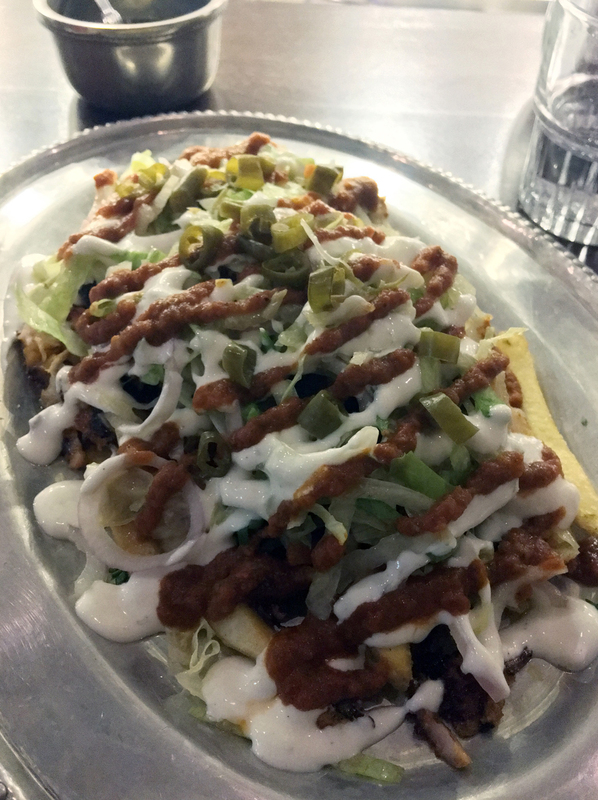 Reservations aren’t taken, but, as with nearby JKS stablemate Hoppers, if a table isn’t immediately available then your phone number is taken and you’ll be texted as soon as one is available while you cool your heels elsewhere. While Berenjak’s distressed chic décor is certainly handsome, one of the best places to sit isn’t at a table but at the counter surrounding the ‘main’ kitchen on the ground floor. Assuming that you’re tall enough to perch on the stools comfortably, you’ll be able to observe Samyani’s firm yet kindly guidance over his brigade including the baker preparing breads to order in the tandoor-style oven. 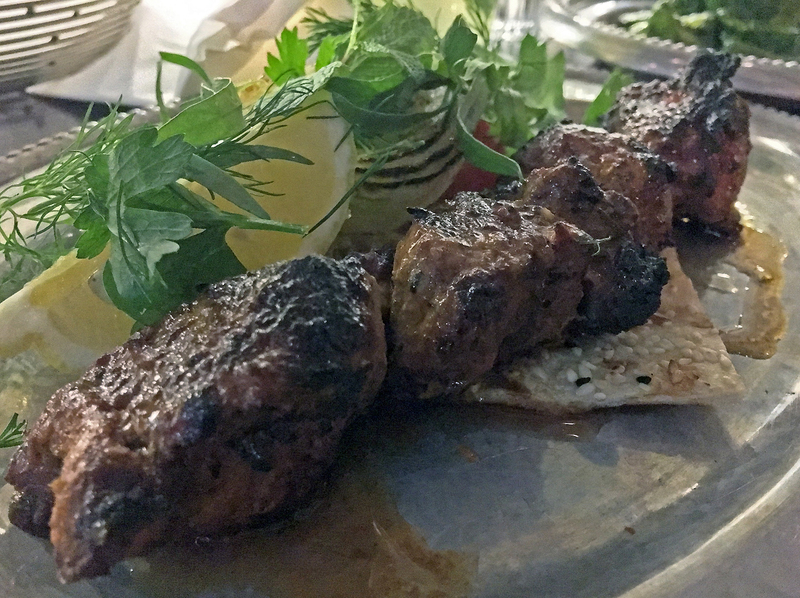 It would be easy to assume that Berenjak’s Iranian kebabs don’t have much to say for themselves, especially in a town hardly short of a Turkish mangal or two. Making such an assumption would be eminently foolish, depriving you of some truly glorious eating. 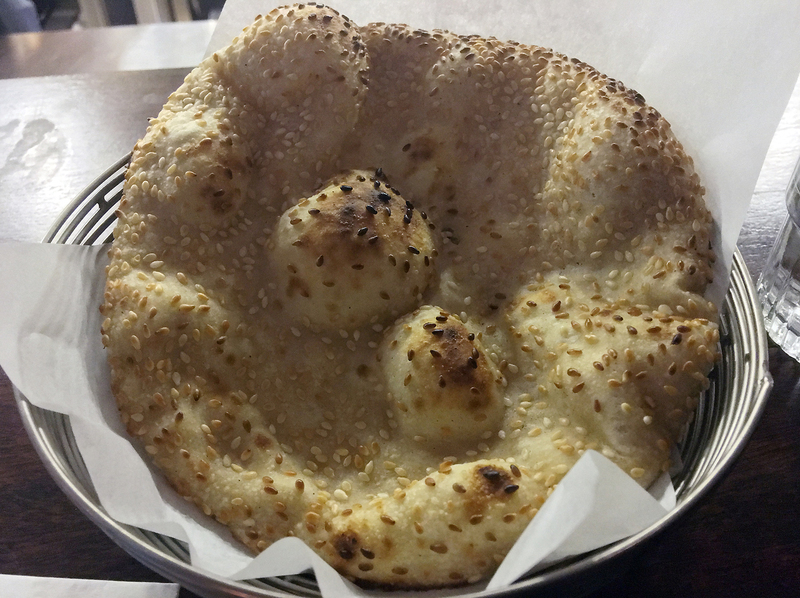 Of the two baked-to-order breads at Berenjak, the taftoon is by far my favourite. 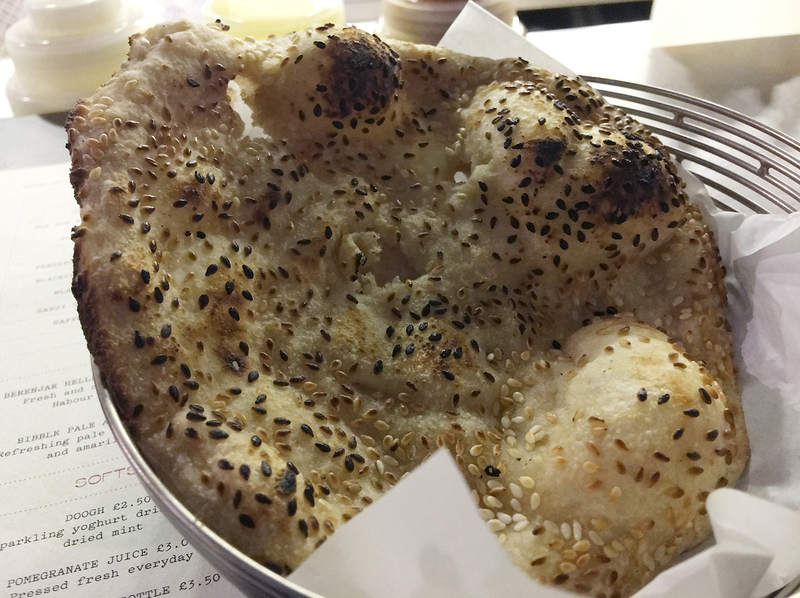 Although dotted with sesame, the main attraction here was mouthfeel rather than flavour – puffy and tearable with a gentle tug, then light and fluffy. Yet it was also stiff and absorbent enough to scoop up or soak the various dips and sauces that you’ll encounter. I declare my loyalty to Prince Tuftan, heir to the Tiger Empire! The sangak was the taftoun’s diametric opposite. 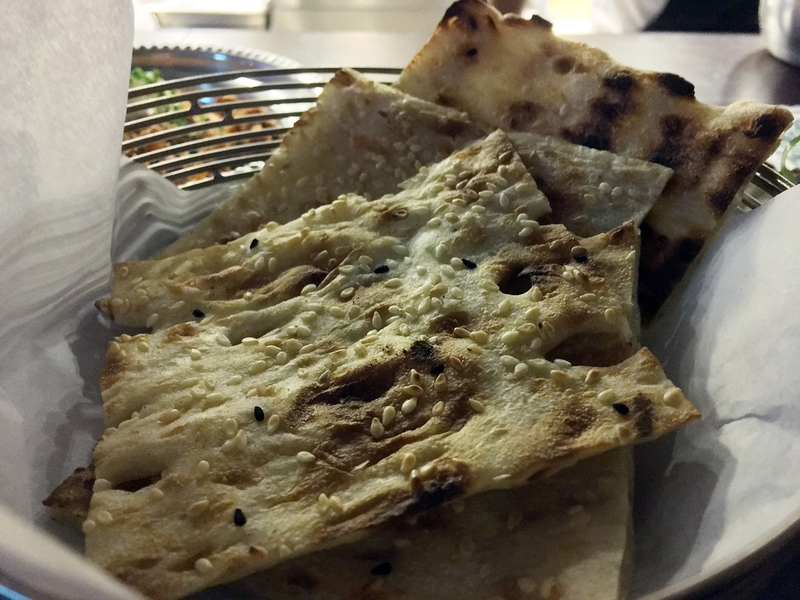 While the sesame seeds gave this flatbread an unmistakably bold flavour, its wafer thin nature meant it wasn’t anywhere as satisfying or as utilitarian as the taftoun. 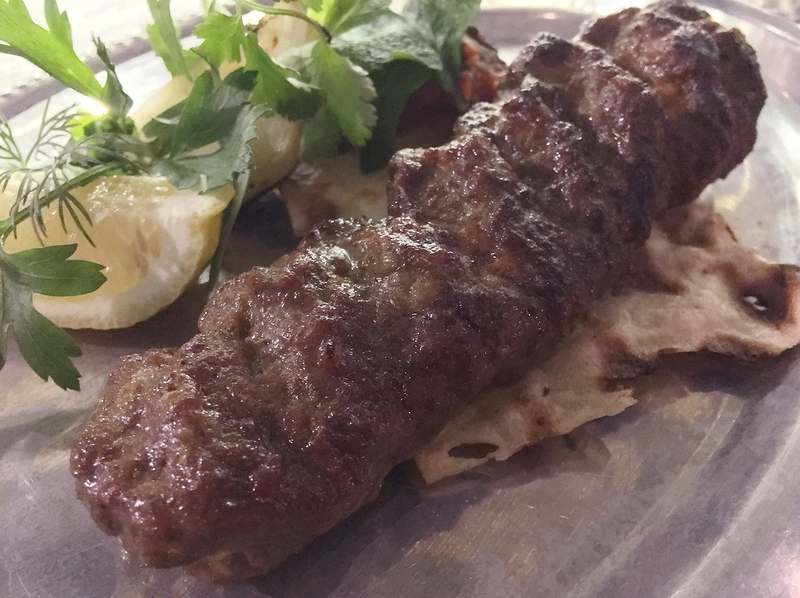 The goat kebab may not look that different from your everyday lamb kofte, but this was an uncommonly sumptuous kebab. My lips rarely have the pleasure of enjoying something so thick, smooth and meaty with occasional squirts of lightly fatty juices trickling down my gullet. 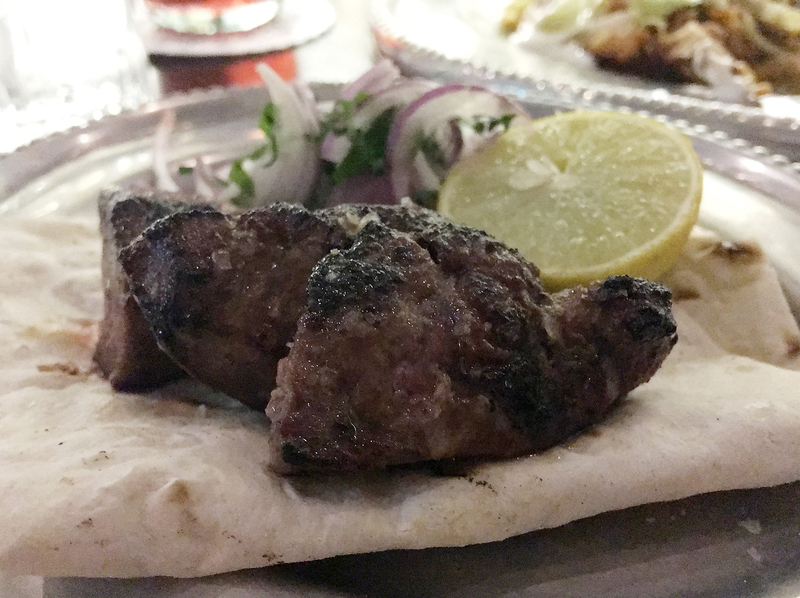 Skewered chunks of lamb rump were, likewise, in a different league from other bleating mammal shish kebabs. The dense, moist, springy pieces of meat had occasional offaly liver-like hints. Superb. 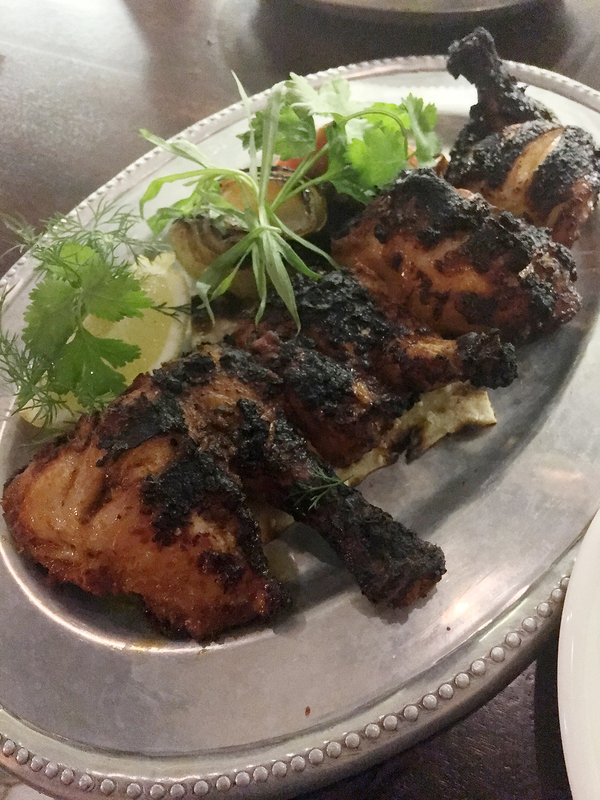 A whole poussin, quartered and skewered, resembled a tandoori chicken but it was hardly worse off for the resemblance. Although a tad boney in place, the meat was a smoky, succulent treat with a charred crust and a slick of piquant oil here and there. A melange of chicken and lamb shawarma sitting on a bed of fries, with chilli sauce and yoghurt criss-crossing the entire thing, initially appeared to be a postmodernist joke about our high street eating habits taken one step too far. And yet the entire dish was unexpectedly enjoyable, from the charred shreds of earthy lamb and smoky chicken to the peppery chilli sauce and milky yoghurt. Even the cheapo salad and the fries, dusted with what appeared to be paprika, had their place providing a touch of refreshment and some ballast respectively. The lone dud amongst all the kebabs was the chicken shish. While generously sized, the thigh chunks were a tad dry and lacking in smokiness. It wasn’t a complete loss as the scent of saffron, while bold, never become overpowering or cloying. Even so, this was easily the least impressive of all Berenjak’s kebabs. 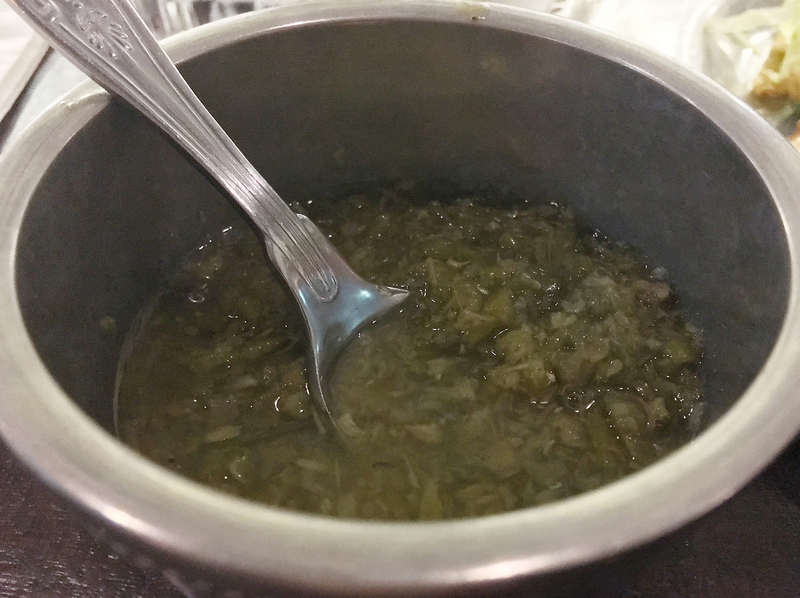 There are only a handful of stews on Berenjak’s menu, but they lend credence to the commendable philosophy of offering only a few dishes executed to a high standard. 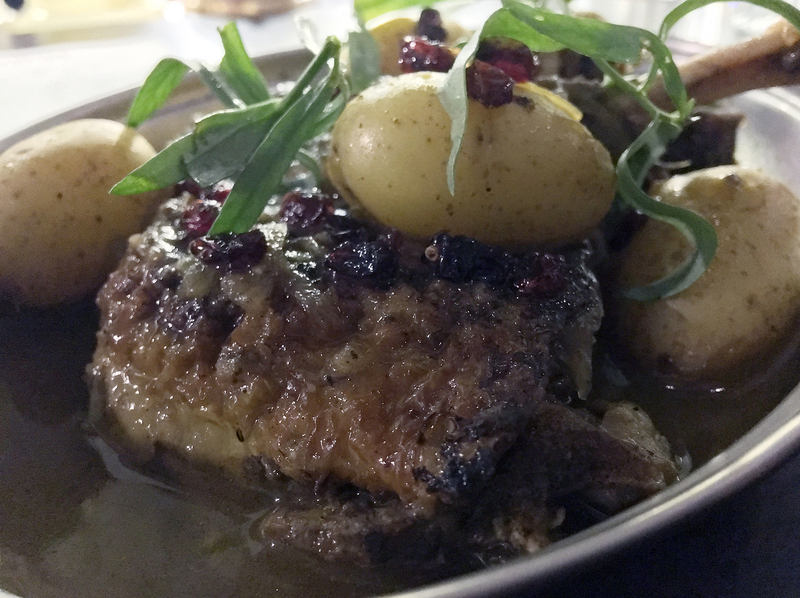 Moist and gamey cuts of guinea fowl came in a thin, gently moreish sauce livened up by sweet, sharp fruit. This combination of savoury meat and sweet fruit seems particularly Iranian to my inexperienced eyes, the acidity of the fruit balanced neatly against the moreish meat. A stew of aubergine and split peas successfully paired the fleshy buttery smokiness of the former with the zesty sharpness of the latter, each neatly counterbalancing the other. A version of this stew with added beef shortrib was, unsurprisingly, a different beast. 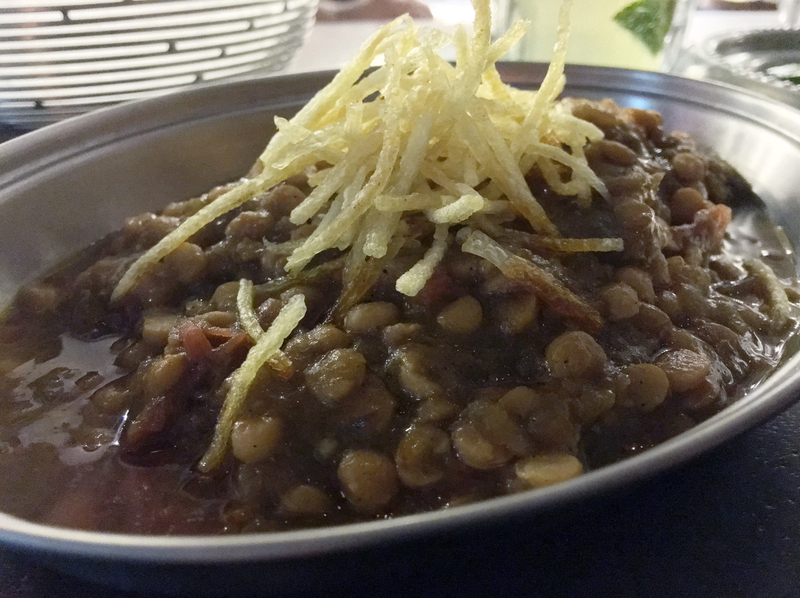 The aubergine was effectively overshadowed by the sinewy, gelatinous charms of the tender cow, the beef taking the eggplant’s place as counterweight to the lentils. It wasn’t worse than the original meatless version, just bolder, brassier and more in your face. 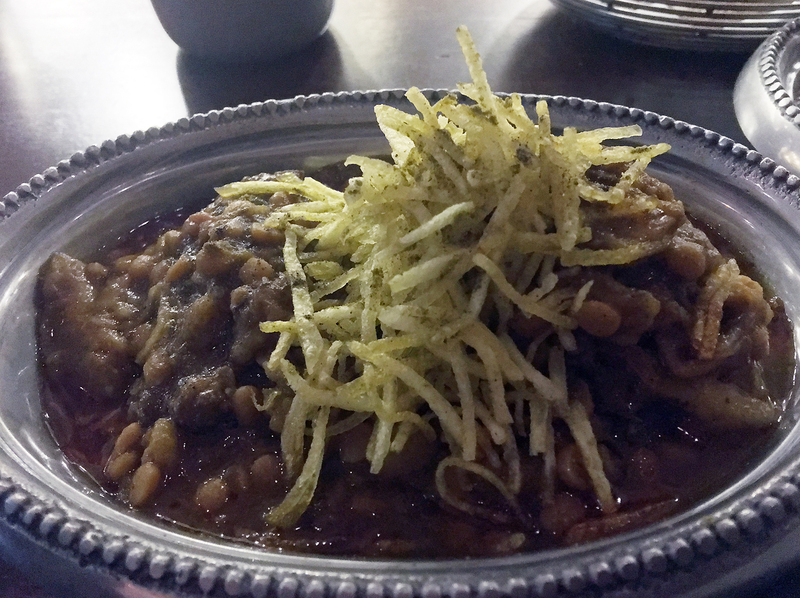 Berenjak’s hummus was thick, hearty and moreish – almost meatily so. 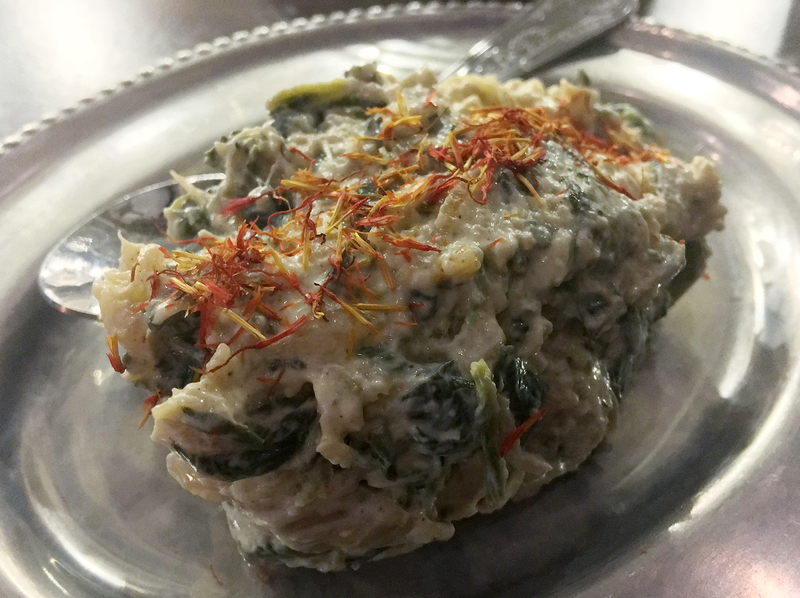 Hints of citrus and a molasses-like sweetness rounded off a chickpea and tahini dip of remarkable depth and nuance. Pureed aubergine was smoky and fleshy, topped with crisp and chewy fried shallots. 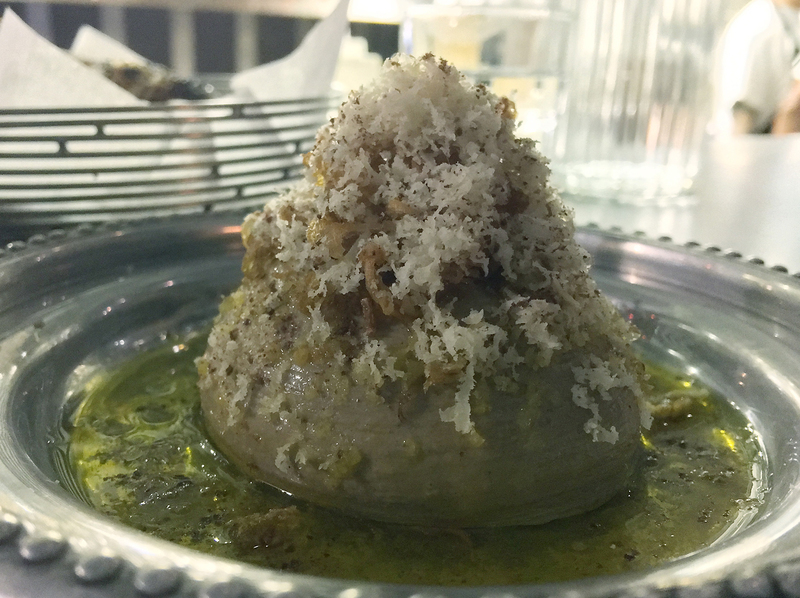 It was somewhat similar to a Levantine baba ghanoush, but more hearty and warming. 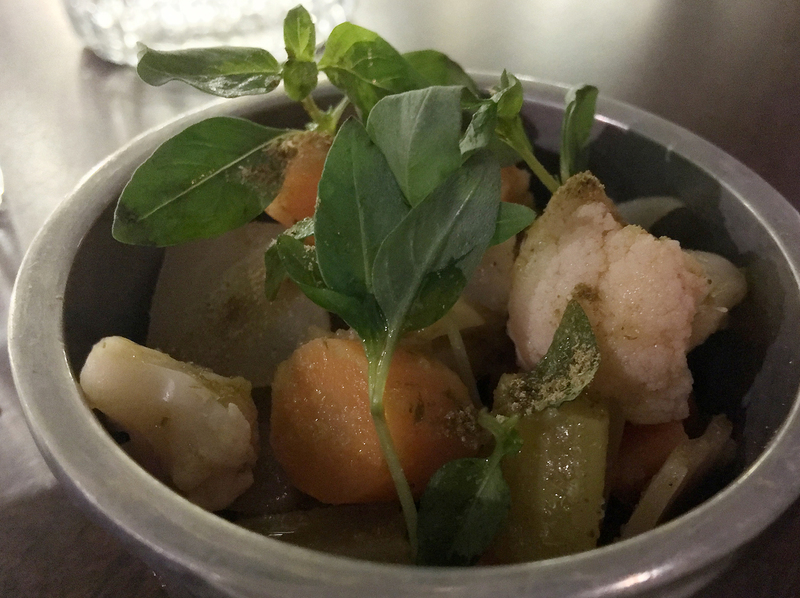 A selection of pickled vegetables, including carrots and cauliflower, impressed with their tart, mustard-ish flavours. 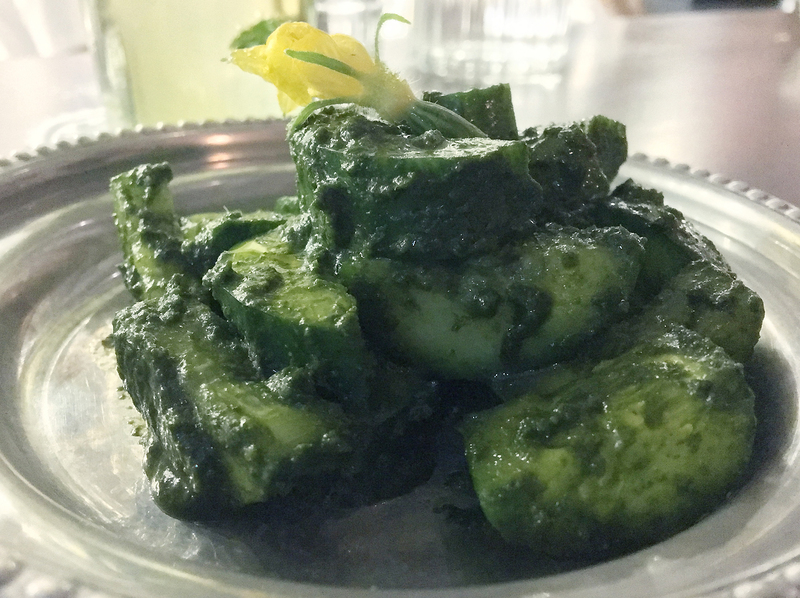 Briney, crunchy cucumbers, like the pickled vegetables, were a tart and refreshing accompaniment to Berenjak’s meaty, relatively heavy mains. 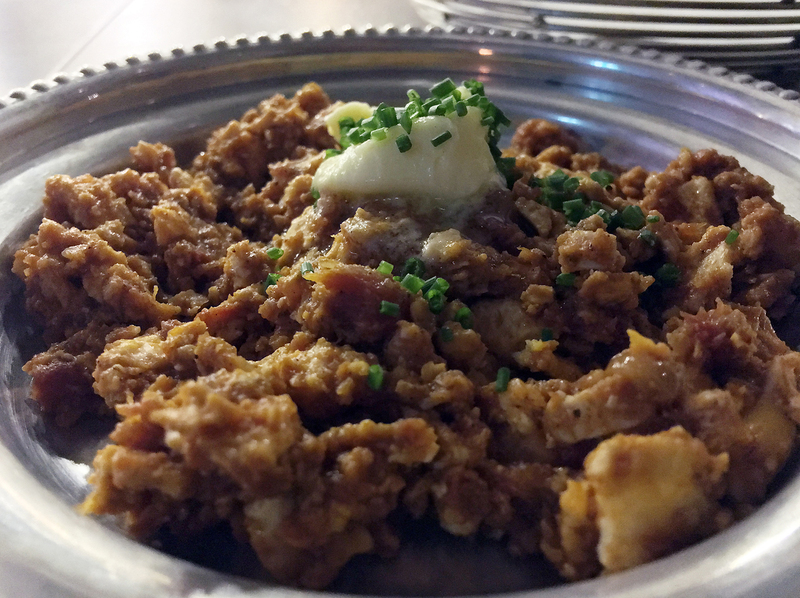 Berenjak’s omelette was smoother and more velvety than most versions, bearing more of a resemblance to scrambled eggs. Either way, its lightly creamy qualities made for fine eating. You can’t make photo captions without cracking out some puns every now and again. 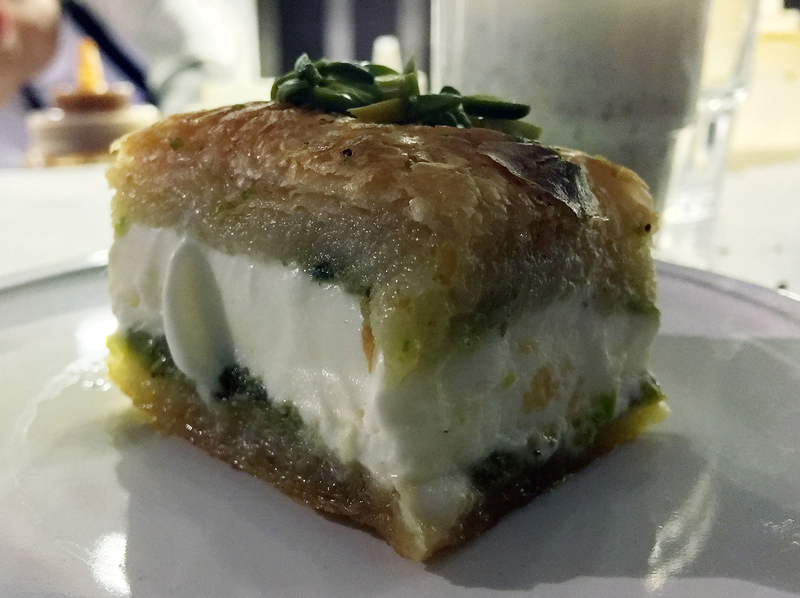 The feta here wasn’t crumbly and chalky, but dense, smooth and milky while retaining a light saltiness. 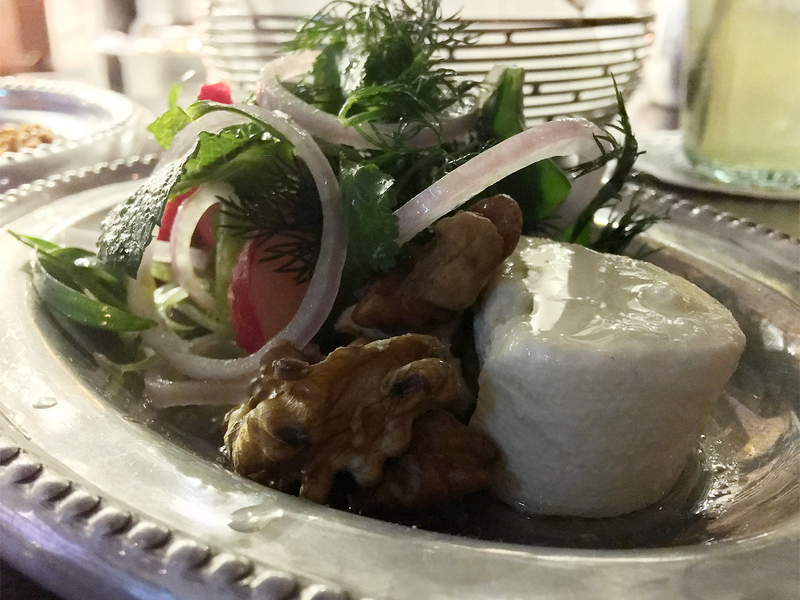 It was a remarkably delightful cheese made even better by the refreshing combination of parsley, crisp radishes, sharp red onions and walnuts. It’s the feta we’ve been missing all our lives. I detested eating pig’s liver while growing up, but I may have had a different opinion if I had spent my childhood eating Berenjak’s calves liver instead. Earthy yet light, chewy and gently rather than overpoweringly coarse, it’s the offal dish good enough to possibly win over offal sceptics. 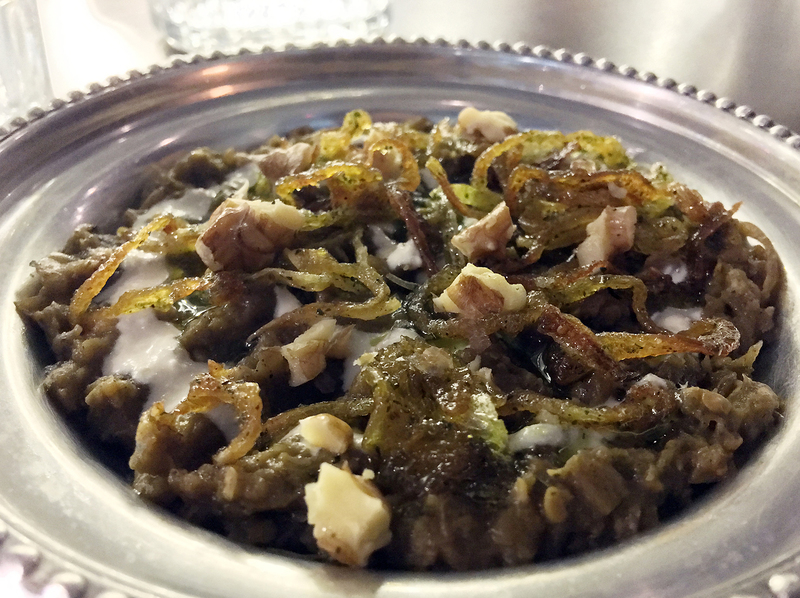 The sprightly red onions and parsley were well-chosen garnishes, although the sangak flatbread arguably smothered the liver’s qualities. The bread was best enjoyed afterwards. Pickled chillies had a zingy, tingly warmth, a quality that was especially welcome as a much needed boost to the tame chicken kebab. The anti-Instagramness of this side dish pleases me. The olives were, like some of my previous lovers, skinny with big pits. Much of the joy here came not from the olives themselves, but from punchily moreish dressing of pomegranate and what appeared to be mashed parsley and coriander. To my previous lovers: don’t write in or @ me. I ain’t listenin’. Although it looks like a Russian salad, the Greek yoghurt mixed with spinach and garlic was far more satisfying than any version of that dish that I’ve ever had. Thick, refreshing and moreish all at the same time, I’d quite happily scoff this beauty for the rest of my days. An alternative Greek yoghurt dish, this one mixed with raisins and cucumbers, wasn’t quite as seminal but it certainly wasn’t short on charm. The thick and refreshing yoghurt had a brisk sweetness derived from the cucumbers, while the raisins provided a springy chewiness rather than intruding with a sugary sweetness of their own. 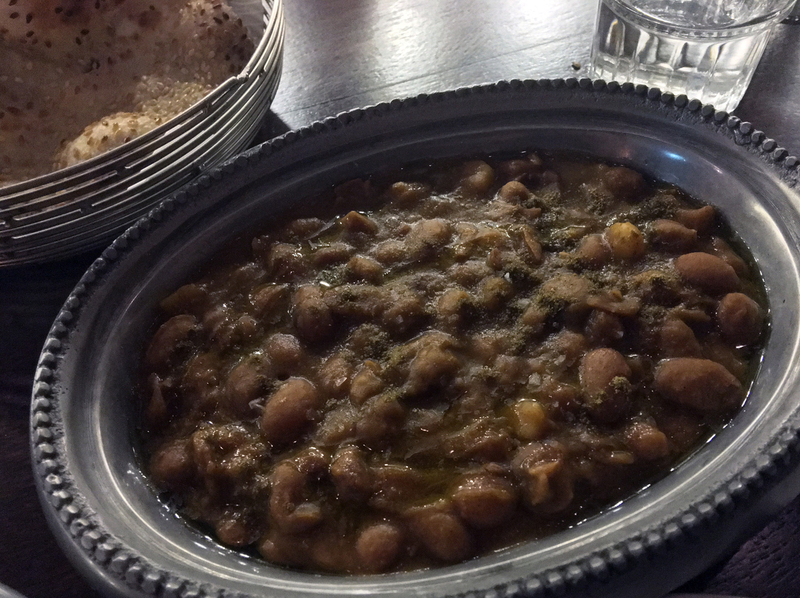 Pinto beans were, unsurprisingly, very Mexicanish in their creamy, hearty, moreish softness. Beware though: they’re so hearty, they’re almost a meal in of themselves! 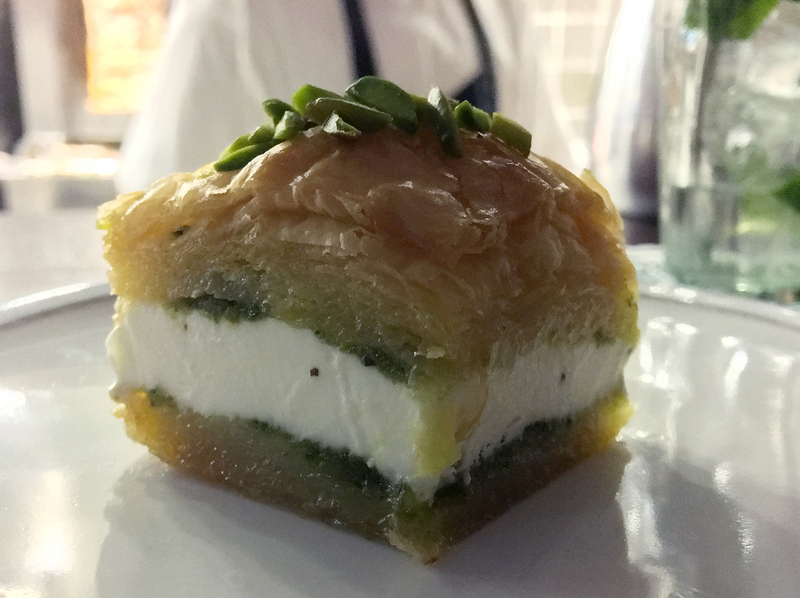 At the time of writing, there’s only one dessert on the menu at Berenjak – a baklava ice cream sandwich. It got off on the wrong foot in its first appearance with a papery, dry and excessively chewy mouthfeel. 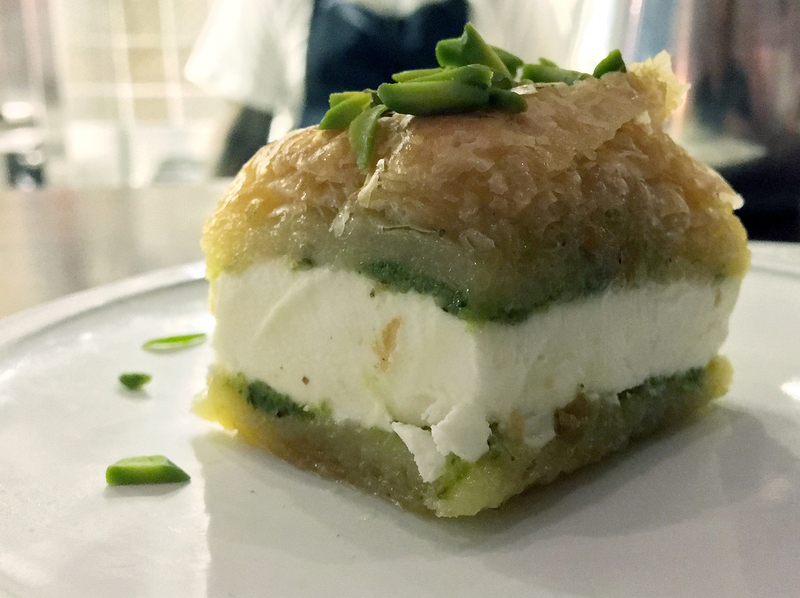 Later iterations, while unlikely to set the world of baklava alight, were far better with softer, flakier, sweeter and more dewy pastry. Dusted with crushed pistachio, it proved to be a far more worthy partner for the smooth, refreshing ice cream. I sometimes wonder if, upon being recognised or having my identity deduced, whether I’m receiving special treatment. But then I’m sat in almost non-existent lighting on a stool ill-suited to my stumpy height and I breathe a sigh of relief. This is an odd life that I’ve chosen for myself. Convincing people to pay non-trivial, sustainable amounts of money for kebabs is a tricky business. There are already a few restaurants that have managed this feat, but if ever there was a kebab restaurant that deserved your coin then it’s Berenjak. 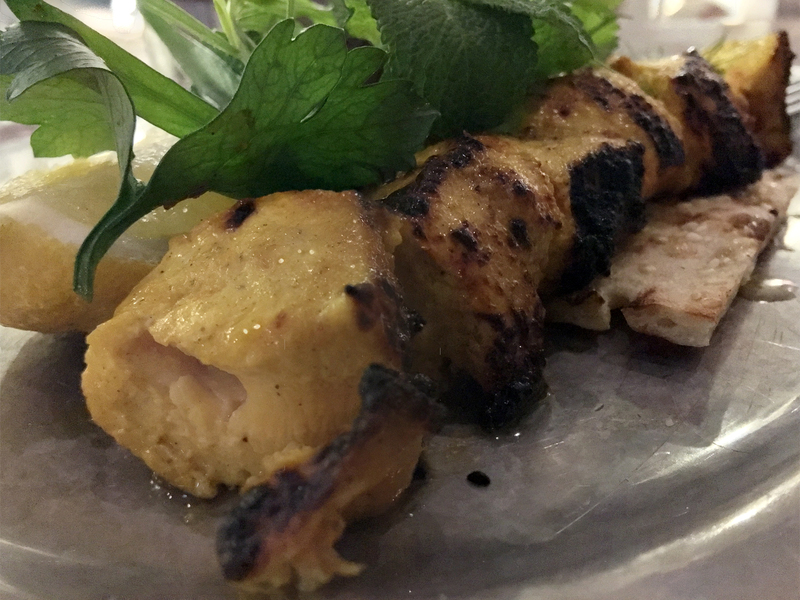 Some of the dishes may look humdrum at first glance, but they – kebab and non-kebab alike – are anything but. The kitchen’s verve, skill and precision have produced dishes that are not only elegantly sumptuous, but addictive too. 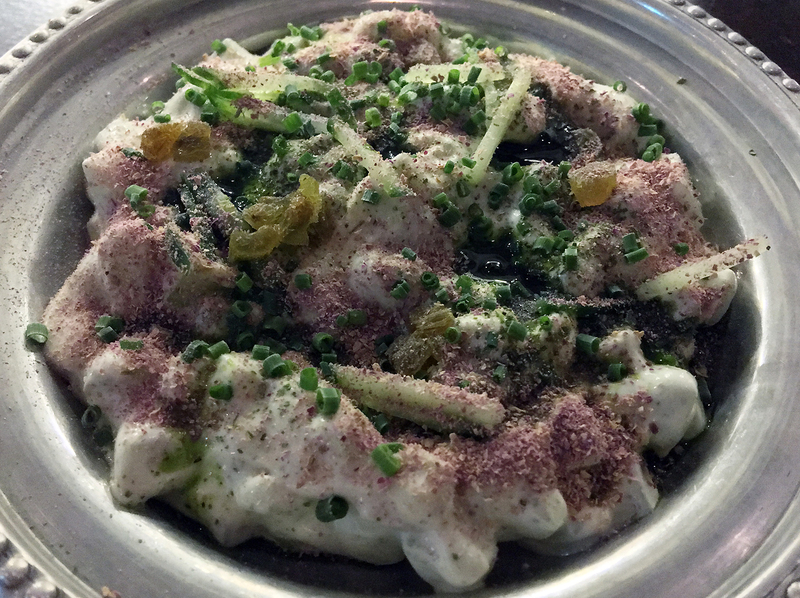 Berenjak isn’t the first Iranian restaurant in London, but it nonetheless sets a high standard for accessibility as well as sheer deliciousness. Forget Brigadiers, this is where you should be warming your cockles this winter. Opening Hours: Monday-Wednesday noon-15.00 and 17.30-22.30. Thursday-Friday noon-15.00 and 17.30-23.00. Saturday noon-23.00. Closed Sunday. Average cost for one person including soft drinks and service charge: £50-55 approx. Tags: aubergine, baklava, beans, berenjak, bread, brigadiers, chicken, cucumber, feta, guinea fowl, hummus, ice cream, kebab, kofte, lentil, liver, london, olives, omelette, pickles, poussin, raisins, restaurant, review, salad, shawarma, shish, spinach, stew, yoghurt. Bookmark the permalink.